As we are working through our calendar and planning out the parties we have coming up for the holiday season, we are making sure we have all of the essentials on hand. Below is a short list of party must haves that will ensure entertaining success anytime you have people over this holiday season. Bar Essentials - We love Govino shatterproof flutes. You can throw these through a window and they won't break. And the best thing is...they look like real glass! So great for our crowd who loves to drink and get rowdy... A Wine decanter - if you're serving red wine, let it breathe! 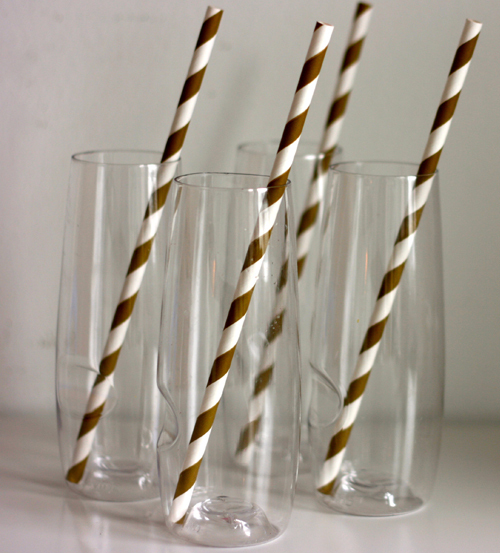 Paper Straws - just too cute to leave out. Beverage bucket - if you don't have a big bucket to keep your drinks on ice, use a glass bowl. Cocktail Napkins - which can double as coasters! Make sure to have tons on hand, set by the bar and food stations. Make your food pretty - We love using cocktail party picks. Bamboo chevron forks or toothpicks with a gold glitzy pom pom...just makes your food look prettier when serving at a party! Party Props are a must these days! With the advance in social media you don't want to miss a beat. Encourage your guests to snap shots throughout the night with fun, festive props. We love The Manic Moose for her high quality, glitter props on a stick! Have any party tips to share with us? We'd love to hear! Leave em in the comments section below...CHEERS!